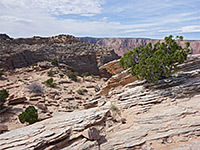 The southernmost ten miles of the Paria River flows through a deep, wide red rock gorge, rather different to the sinuous narrows further upstream, and for all of this distance the canyon has only one significant tributary, on the east side - this is Water Pockets, a rocky drainage only about 2 miles long, containing a series of potholes that retain water for a long time after rainfall. The lower section is the most dramatic, with some cliff-bound, slot-like channels separated by dryfalls, but this is difficult to reach, however the upper section is still quite photogenic, enclosed by large areas of eroded, red and white rocks. Water Pockets can be reached by a relatively long hike starting along a sandy track west of US 89, just south of the Utah stateline - walking first over the wide plain of Ferry Swale, then up a steepening slope to the dramatic rim of the Paria River canyon, followed by a northwards traverse over undulating, rocky terrain, and a descent of a series of benches and ledges to the streambed. 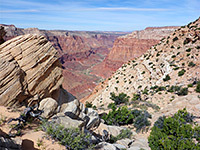 Unless exploring the enclosed lower section, which would require rappelling equipment, Water Pockets is not so spectacular; instead, the best aspects of the hike are the rim of the Paria canyon, and the long-distance views to the east, towards Lake Powell. The tracks across Ferry Swale receive limited use by ATVs, but hardly anyone seems to visit the canyons beyond. Water Pockets topographic map, overview map for Vermilion Cliffs NM. 13 views of the canyon. A suitable parking place, for 2WD vehicles, is at Ferry Swale Tank, 3.5 miles from US 89 along good quality sandy tracks - leaving the highway 1.7 miles south of the stateline, initially along an old section of paved road, then turning left after 0.8 miles, along a straight track that soon arrives at a junction just south of Bishops Tank, where three BLM notices give information about the Ferry Swale area, mostly aimed at ATV drivers. From here the main track veers west then southwest, past a junction with a narrower route to Stud Horse Point, passing under two sets of powerlines to Ferry Swale Tank, site of a seasonal pool used by cattle. 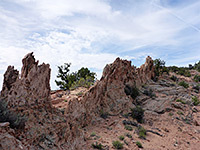 The onwards route is still quite firm initially, but gradually becomes sandier and has only limited turning places, so 2WD vehicles are best left at the tank, however 4WD can continue another 2.7 miles, past a sign at the boundary of Vermilion Cliffs National Monument, and on to a fence marking the edge of the Paria Canyon-Vermilion Cliffs Wilderness Area. The last mile or so has much soft sand, as the track, initially flat, starts to climb gradually, approaching steeper, rockier terrain that ahead continues rising towards the rim of the Paria canyon. From the end of the track, a faint path continues southwest a short distance, leading to a dry wash, which soon enters an enclosed channel beneath a dryfall, as the sandy terrain is replaced by large areas of exposed rock. Blackbrush is the most widespread plant hereabouts, also yucca and a scattering of wildflowers, including several species of phacelia, cryptantha, milkvetch and mustard. Another rocky wash runs close by to the north, and the easiest route is up the ridge between the two, climbing quite steeply for a while, then over a flatter area and up some more to the top of the ridge that forms in the eastern Paria Canyon rim, lined with jagged ridges, pinnacles and other weathered, thin-layered sandstone formations. Below is a steep-sided bowl and beyond, over 2,000 feet lower than the rim, is the Paria River itself, flowing through a wide valley lined with colorful hills of the Chinle Formation, at the foot of huge red cliffs. The upstream end of Water Pockets canyon is about 2 miles northwest of this viewpoint, beyond two promontories. The walking route is along the rim at first, rising slightly to pass below a whitish butte, beyond which all of the drainage is in full view. The upper end can be entered by continuing northwest, down slopes and benches and across a few small gullies, dropping about 500 feet to the streambed, the far side of which is still bordered by tall cliffs. The wash can be followed downstream for only a short distance, before the first potholes and dryfalls put an end to easy travel, though the drainage stays relatively wide for another half mile. There are possible re-entry routes lower down, involving scrambling across extensive slickrock slopes, however more dryfalls lay in wait, before the deep narrows along the lower end of the canyon. The shortest return route to the trailhead is due east, climbing away from the canyon, across a broad, bushy plateau to the rim of low cliffs on the far side, a point that has fine views of Lake Powell. From here, the hike is completed by walking down the sometimes steep slopes, along a shallow drainage then cross-country back towards Ferry Swale Tank.